I’ve got a small backlog of neat things I haven’t yet linkblogged to because once again I’ve got my nose pressed to the wheel, which is sort of uncomfortable, and honestly, a little embarrassing, should anyone notice… but I digress. That sentence was meant to end with a description of what I am doing but you can see a little piece of that above: click on it to see a bigger version of the whole scene. This is a work in progress view of Lew Stone’s laboratory for his story in The Lair of the Clockwork Book. I guess it’s my third mad scientist’s lab for Thrilling Tales of the Downright Unusual. I’m enjoying the way they each have a different atmosphere because all three scientists are such different people. Cornelius Zappencackler’s lab (even more fireproof!) has a cozy and cluttered character; Doctor Rognvald’s lab is shadowy and sinister; and Lew’s lab, shown here, is a bit lighter and more… well, rational, because Lew’s greatest problem as a student is that he isn’t really insane enough for his vocation. I have a couple of devices to add, all part of Lew’s experiment in progress, and then some additional set dressing after that – and just to make things more interesting I’ll also need a demolished version of this room. Because, you know, that’s just what happens. In other news, I took a few hours off yesterday to explore. I was looking for a good used book store in my adopted area – after six years I’ve yet to find one that makes me want to take a deep breath of dustiness and mustiness, make myself at home, and trade in my excess books. I think this is the biggest thing I miss about living in California: near pretty much any of my old neighborhoods in Long Beach, San Luis Obispo, San Francisco, Ventura, or Los Angeles I always had a fantastic assortment of used book stores to haunt. Here, on the other hand, I’ve found just one that was sort of interesting. It’s a sad state of affairs, I can tell you. There’s just one more possibility I know of, out toward Cleveland, that sounds promising: but I’m not sure if I’ll get there before Winter sets in. I’ve been welding enhancements onto the Mug-O-Matic with no regard for my personal safety, and lots of regard for automatically generating the strangest pulp sci fi titles in history… on coffee mugs. Because coffee is important. And it gets all over your lap if you don’t use a mug. 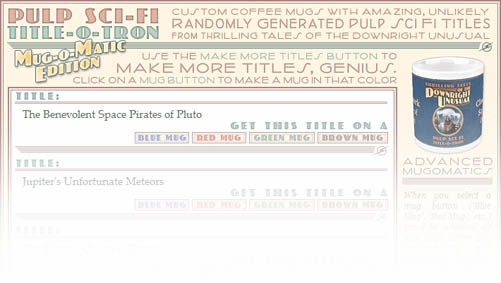 The Mug-O-Matic now has a panel you can use to enter your very own, not-random titles; also, I’ve added a selection of premade mugs with some of my favorite titles, like "Vengeance of the Librarian of Chaos", "The Atomic Brain of Doom", and "The Astronomer That Misplaced the Galaxy". I’m thinking about decaf now. It might be a good idea. Number 2 can go on for quite awhile. 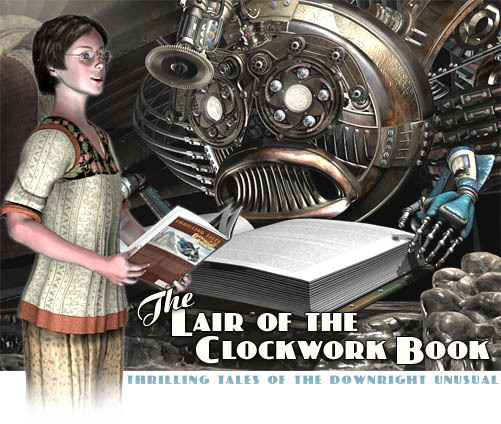 But today The Lair of the Clockwork Book has come out of the OhMyGodWe’reAllGoingToDie stage and hovers at what I guess is about Step 2.9: I’ve made all the big changes, medium sized changes, and tiny polishing changes that I’ve ever meant to do. So the sensible thing is to leave it alone for a day and then give it another complete read-through (it’s always difficult to read it like I’ve never read it before) before what I think will be a final polishing stage. Of course, my mileage may vary. But the upshot is that I’m now very close to the point where I can start in on the illustrations. Once I’ve got about 24 of those done the story can go live, a page at a time, at the Thrilling Tales of the Downright Unusual site. And I can then turn back to Part Two of The Toaster With TWO BRAINS – until I start to run low on Clockwork Book illustrations, anyhow. The interesting ride that is that plan will be starting… sooner, now, if not yet soon. Tauhid Bondia, formerly of the webcomic Good Ship Chronicles, has now embarked on a graphical multiple-choice adventure series called Epicsplosion. This is so much like my own Thrilling Tales of the Downright Unusual that it makes me feel all warm and fuzzy inside even though feeling warm and fuzzy inside is kind of a scary thought, when you think about it, which now that I’ve done it is something that I discourage. Epicsplosion uses animated gifs for its illustrations and can be a little harder (as in ‘more likely to be fatal’) on the characters than what I do in my stories. What really interests me here is that Tauhid seems to be posting updates to the stories live. I ruled that out because it wasn’t possible for me to keep up with all the possible threads in anything like a timely way. So I’m really interested to see how that works out over there. Tauhid’s also either bravely or foolishly using the trademarked phrase "Choose Your Own Adventure". We’ll see how that works out, too. I’m in your corner, buddy. 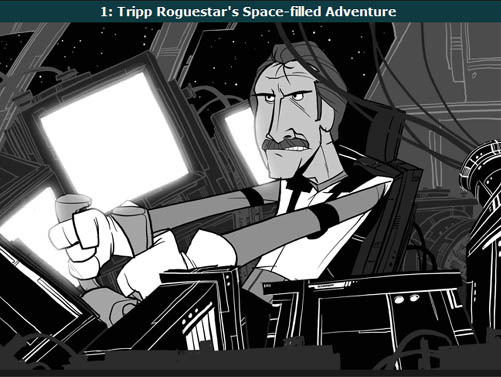 So pop on over and sit in the driver’s seat of Tripp Roguestar’s Space-filled Adventure! Note that there’s some language there that may not be safe for work or for religious fundamentalists, each of which will have to take its chances. Igor Sez: The Mug-O-Matic ith Online and Ready to Make Mugth, Mathter! Through the liberal use of lasers, faceted coprolites, sub-aetheric rays, and a 3/8" open end wrench, I’ve now completed the MUG-O-MATIC edition of Cornelius Zappencackler’s Pulp Sci-Fi Title-O-Tron. It’s glowing where it ought to be glowing and it doesn’t make that high-pitched noise that attracted the squirrels any more. Though I always liked that part, myself. So you, too, adventurer, can now harness the awesome power that is the Mug-O-Matic: it randomly generates the titles of pulp science fiction stories that don’t exist, but often ought to*, and then it slaps your favorite titles onto coffee mugs, travel mugs, and mugs of other mysterious and malevolent kinds that it were not well to mention here. Okay, not really: I just got tired of listing them. Fun little toy, though! *every now and then it manages to re-create a title that does, in fact., exist. Which is even stranger than the thing with the squirrels.